I think Madiun is pretty much the anticlimax for our long and great journey. 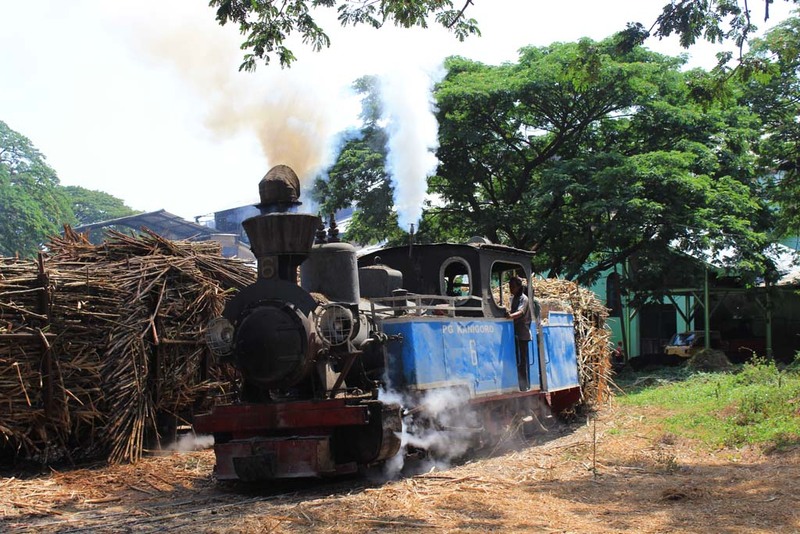 Although Madiun has several sugar mills which still operate steam locomotives on regular basis, they’re pretty much the shadow of their former self. 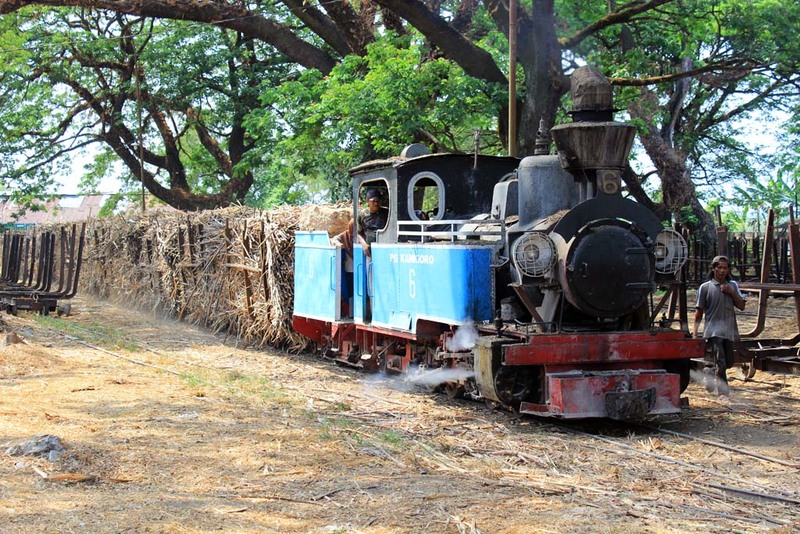 Gone were the days when steam hauled sugarcane train traveling through rural areas. 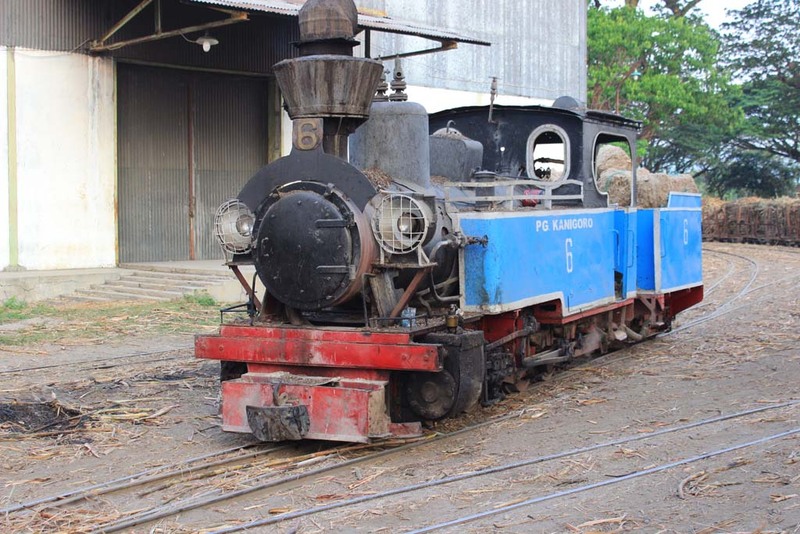 Even one or two locomotives which were considered as the highlight of railfans visit in the past have been scrapped, notably the Henschel-built 0-10-0 Luttermoller at Rejosari mill. 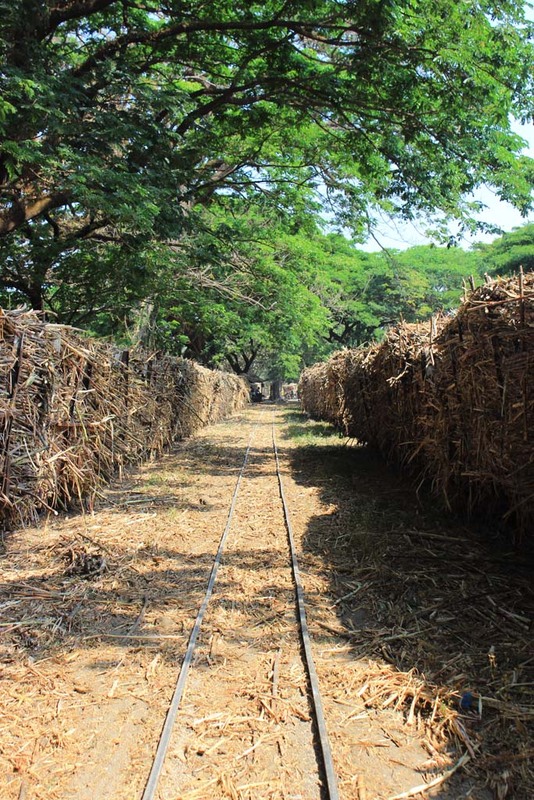 Despite the so-called increasing prosperity of sugar mills in recent years, especially since Mr. Dahlan Iskan took the helm of Ministry of Government Business Enterprise where many sugar mills have been turned from dirty old compound into a clean and modern factory, their railway operation have been excluded from this progress. 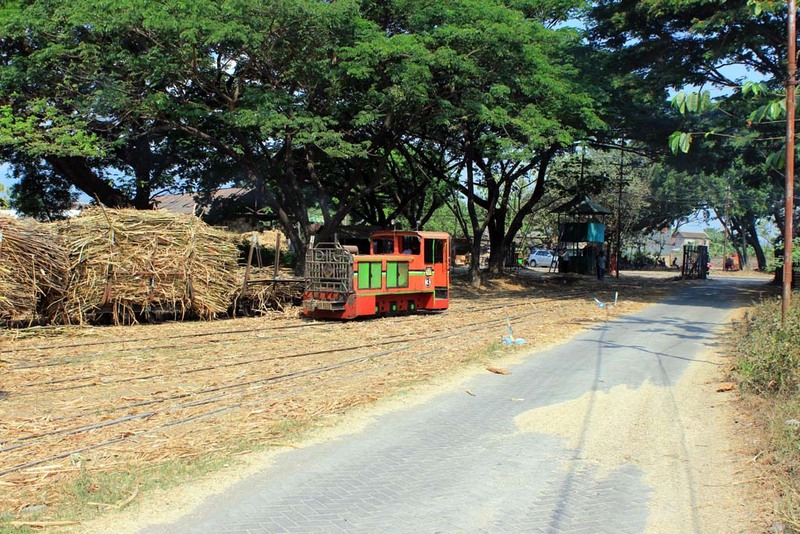 The reason behind that is that the mill doesn’t want to bore the cost of having a network of railway line, not to mention the opposition from a group of truck owner mafias. 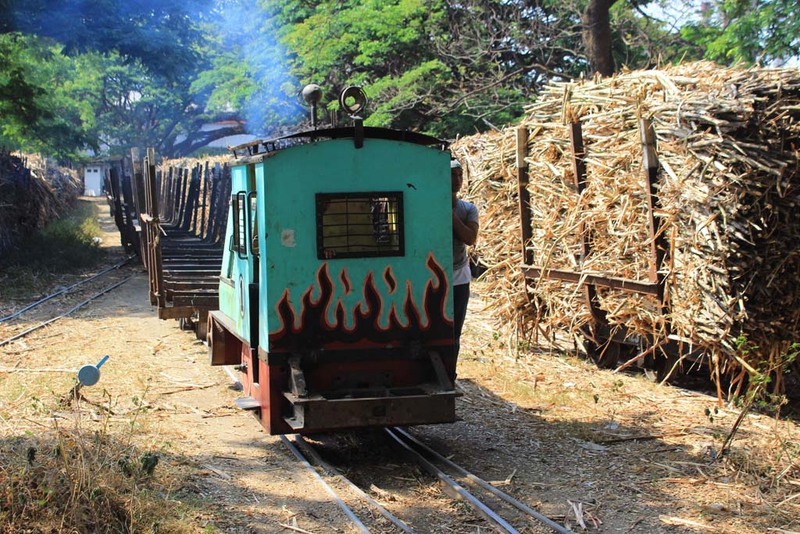 The decline of sugarcane narrow gauge railway operation began when the 1997 Economic Crisis hit our country, exacerbated by the fact that some sugar mills relied solely on aging and sometime poorly maintained steam locomotives. 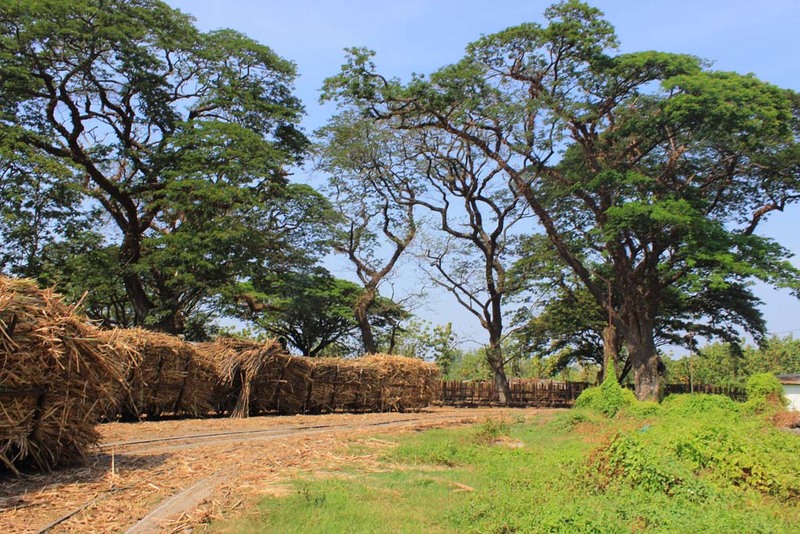 In Madiun, the impact of the economic crisis led to the closure of field lines on many sugar mills, especially in the period between 2000 – 2003. 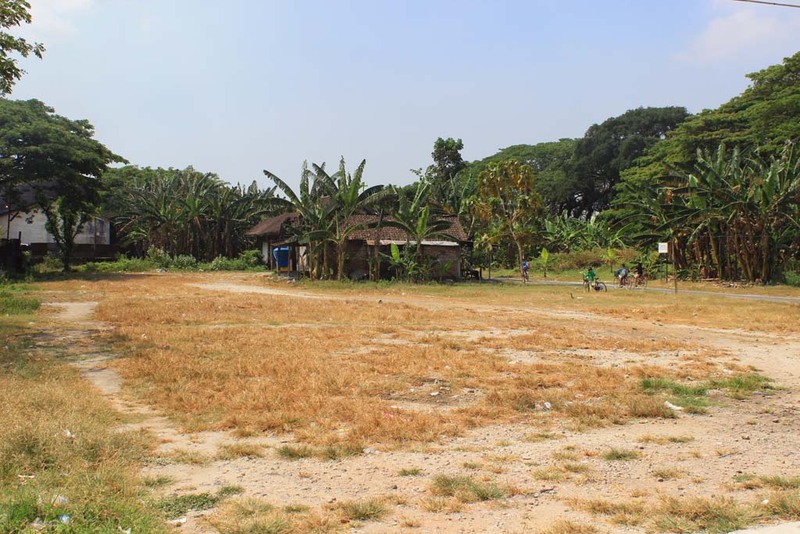 The final blow in Madiun came in 2005 when the city council passing the bill that banning the operation of field lines. 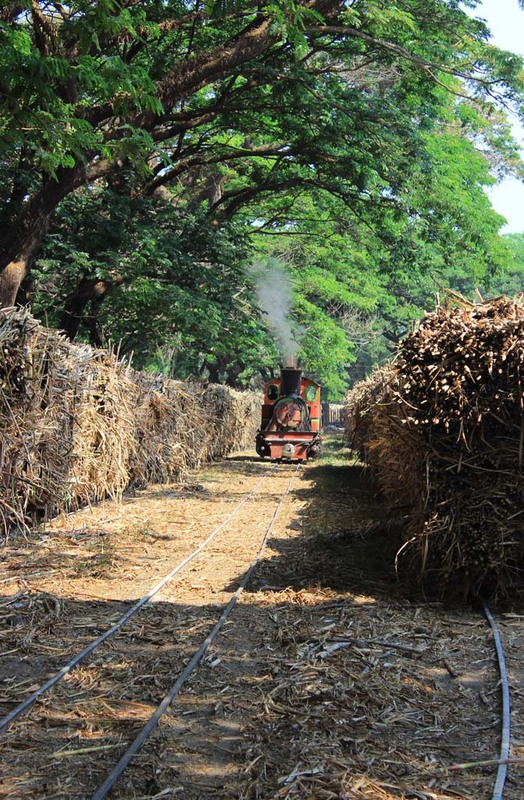 The last sugar mill to operate their field line was Rejoagung sugar mill, which closed their field lines at the same time. 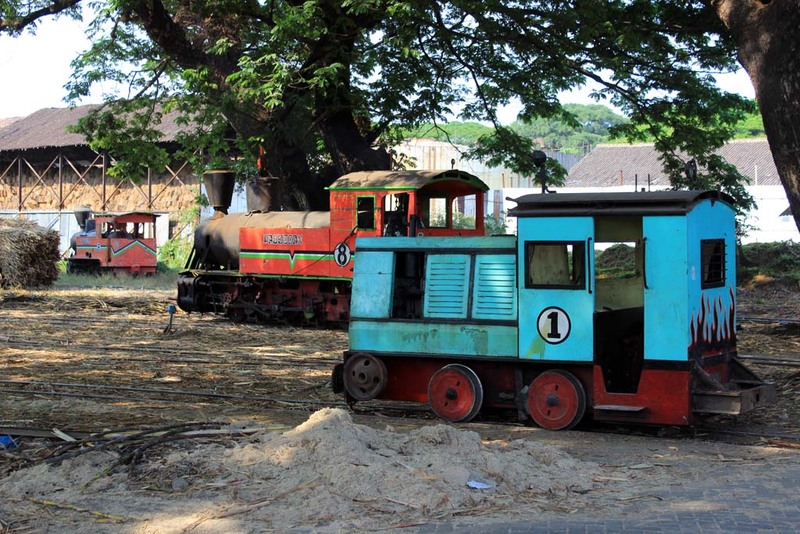 By that time, they had fully reverted to all-diesel operations. 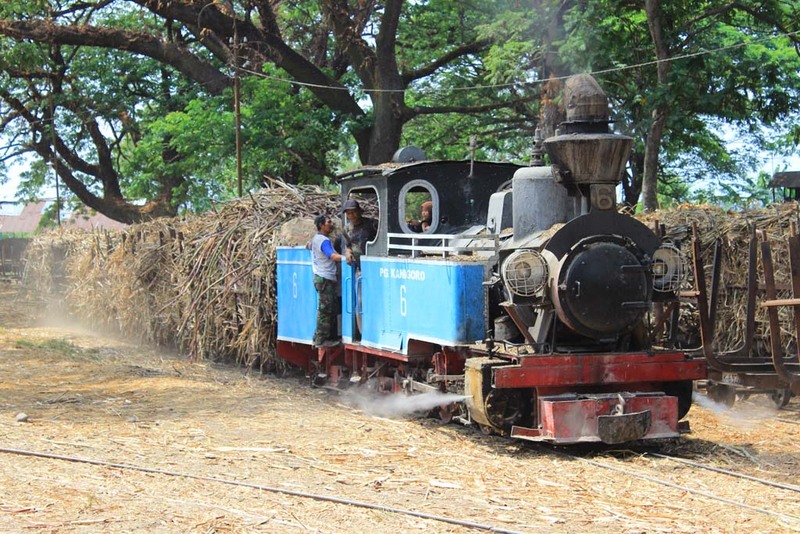 The cited official reasoning was the road traffic disturbance caused by sugarcane trains crossing the main streets. 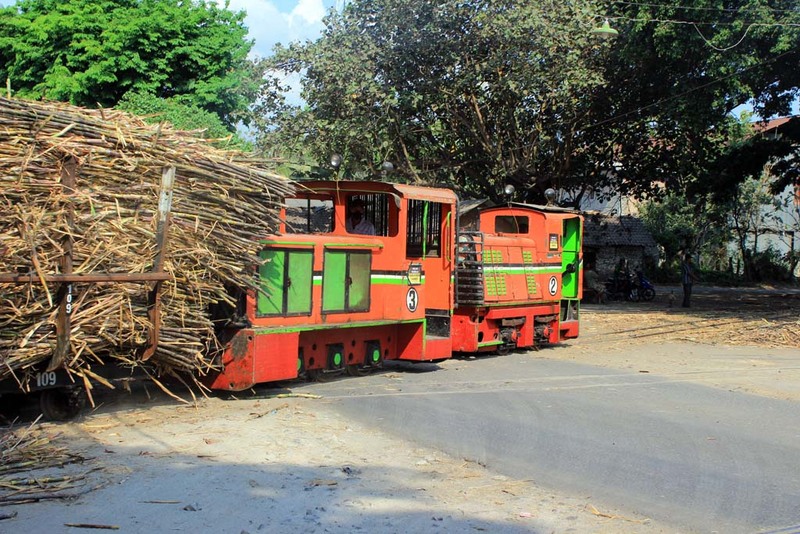 But some in railfans community said that the bill was passed, as some local politicians actually own truck hauling business where some of their clients are sugar mills. So it is obvious that they want to kill their business rival. 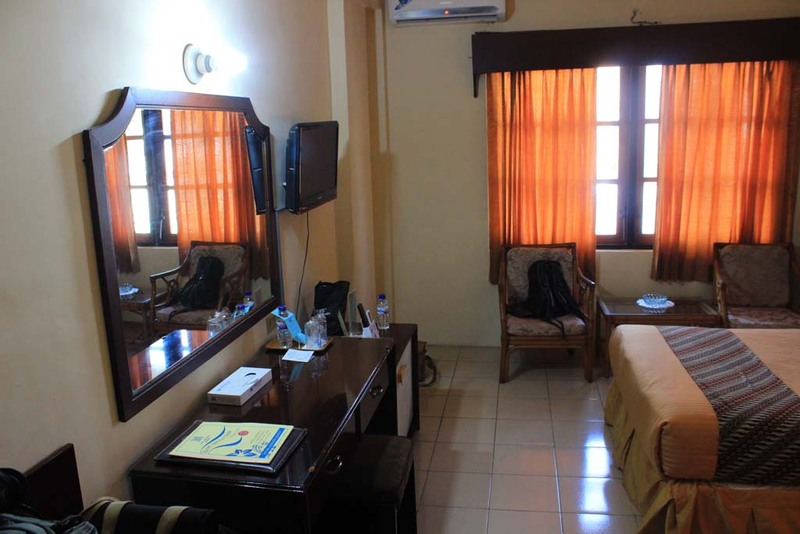 We stayed at famed “Merdeka Hotel”, which up until mid-2014 was the finest hotel in Madiun. 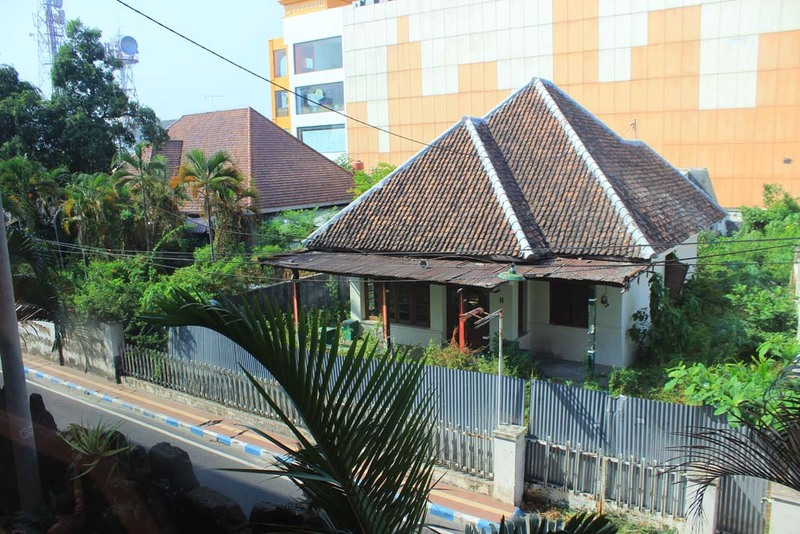 The hotel is located next to row of former colonial era elite housing. Unfortunately, by the time we came here, these beautiful houses are already slated for demolition. Probably to provide expansion space shopping center in the background.. The quality of breakfast is moderate one, at least it is better than those at Winner Premier Pemalang. Just for note, when we checked in into our hotel we were greeted by the delicious smells that came out from the hotel’s kitchen exhaust. So we have high expectation over the quality of the breakfast. But by the time we checked in into the hotel’s restaurant to have breakfast, we found that there is very little variation of menus. I took the fried rice, with some stir fried sausage and vegetables. The quality of the food just….mediocre! 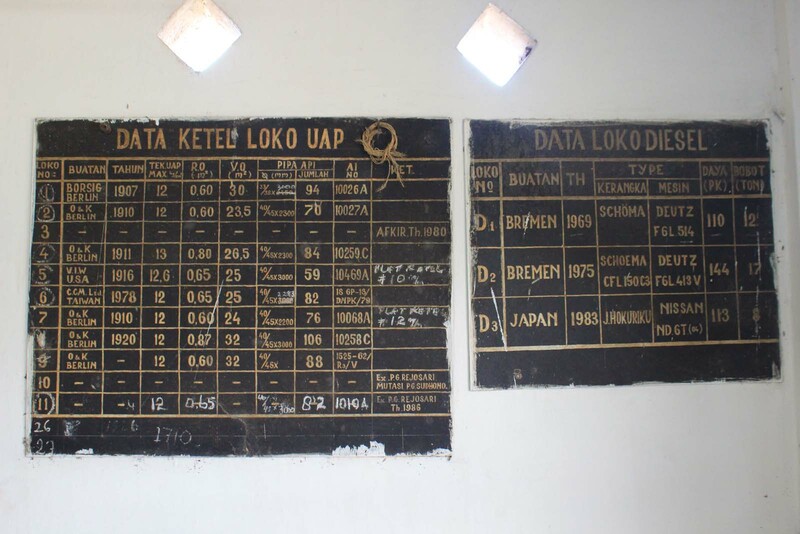 They also served “jamu”, a typical Indonesian herbal drinks with some good health benefit. The problem is: they’re served on used mineral bottle! After we finished our breakfast, we returned back to our tidied up room. 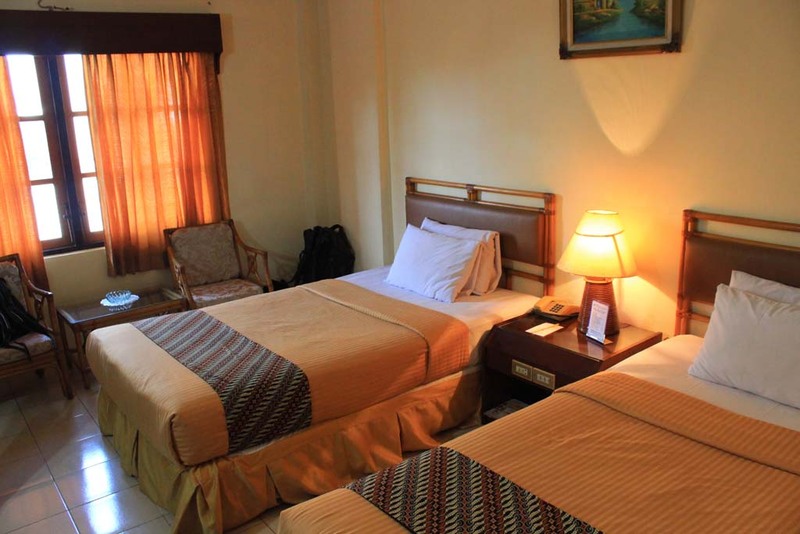 As you can see the room is nice and spacious, although it need some revamp. 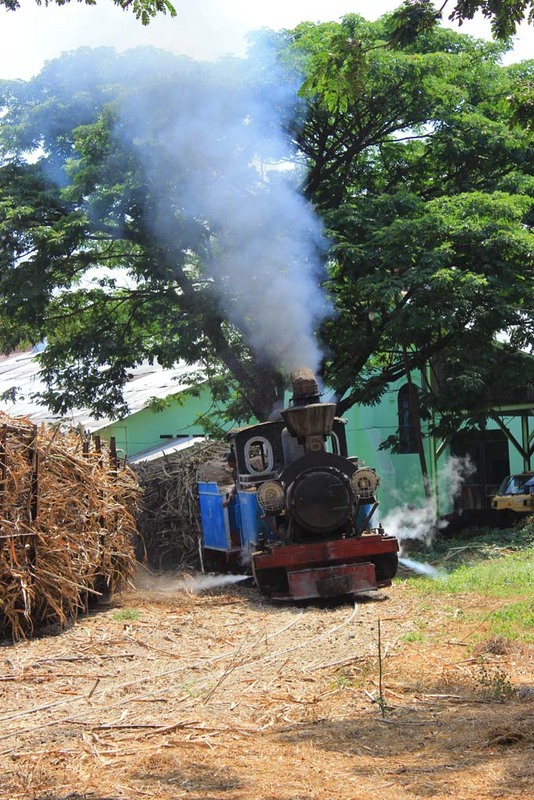 Once we are readied ourselves, we head to our first destination: the nearest sugar mill from the hotel that still feature steam locomotives. 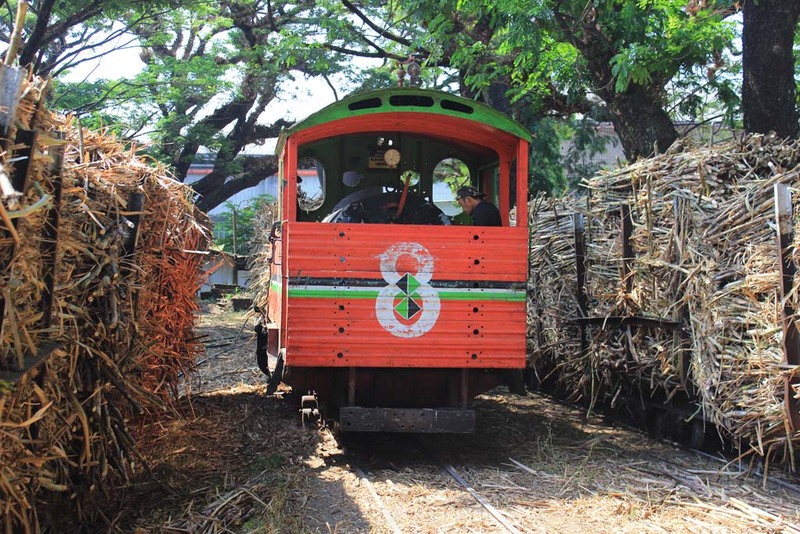 The choice goes to Kanigoro sugar mill, which is located just at the southern border of the town. We went to the administration office, where we were greeted by its staff. They said that foreign visitors must pay the entrance fee. When I asked the price, they said “5 US Dollars”. I was quite surprised by its pricing policy. 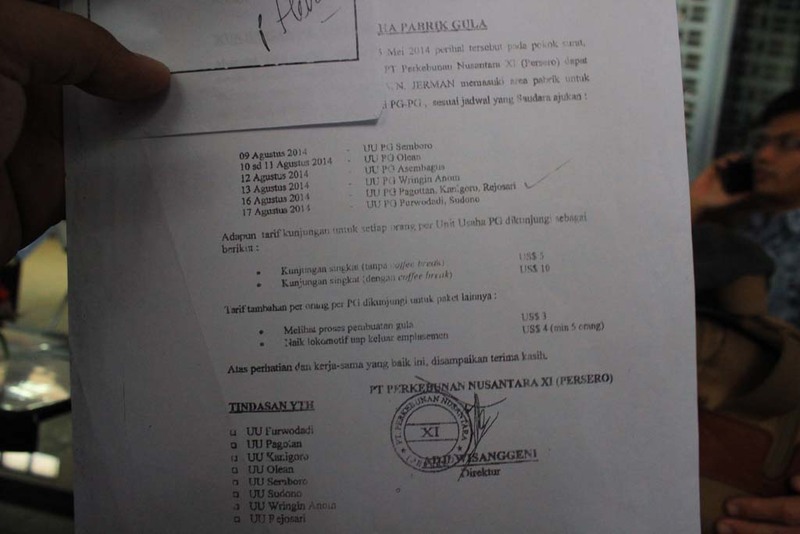 They said that it has been imposed by the central office in Surabaya. They even showed me a permit letter which had been issued for Bernd Seiller’s group. Once we cleared the entrance fee, we went into the mill compound, escorted by one security guard who also acted as a tour guide. 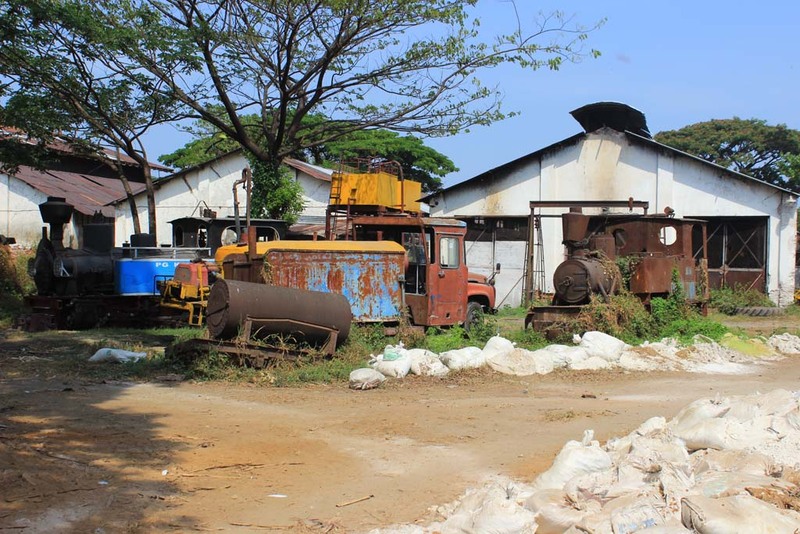 First, we visited the locomotive shed, where some old unused vehicles are parked in front of the shed. 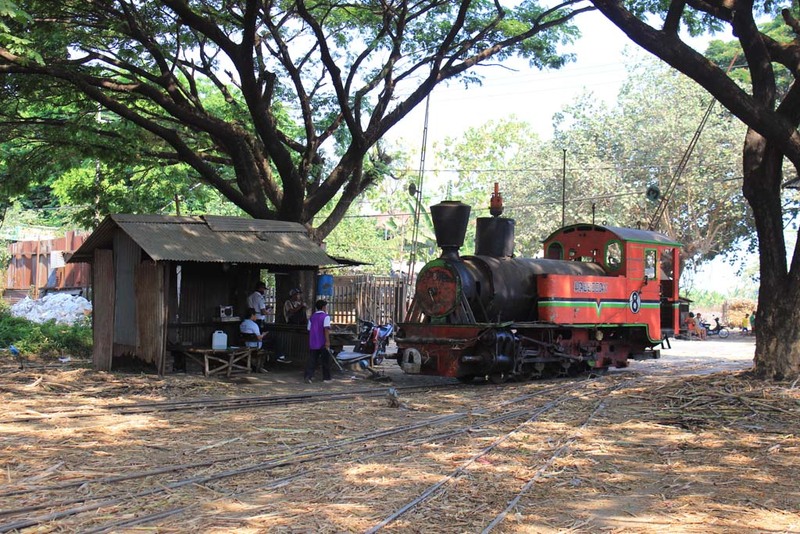 Although there is one working steam loco also parked there. 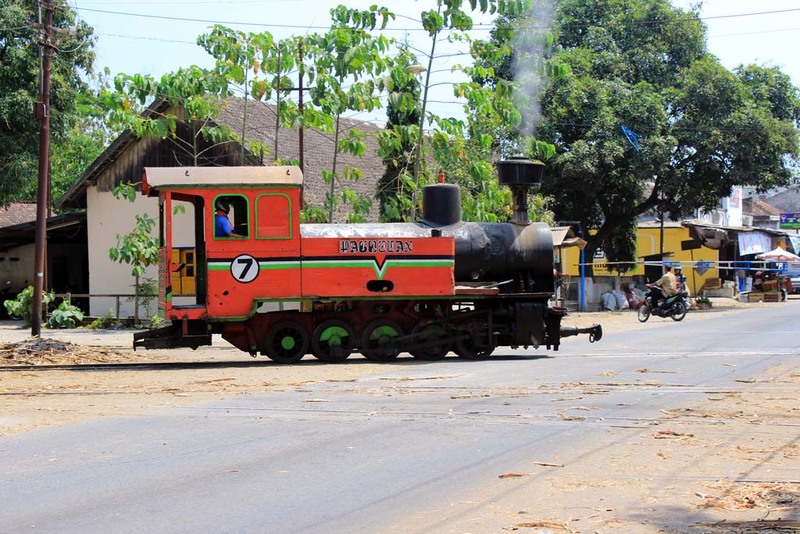 I have no idea about the identity of this particular steam locomotive. 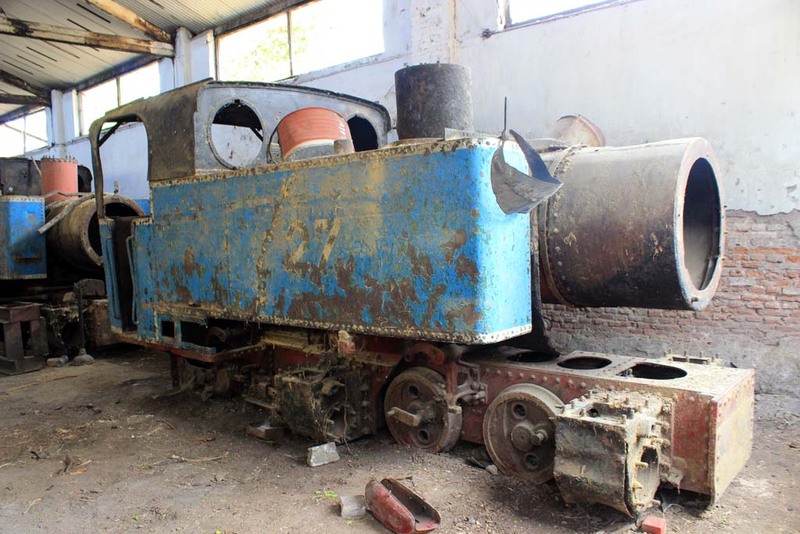 I assume that this loco must have been dumped since 1990s. 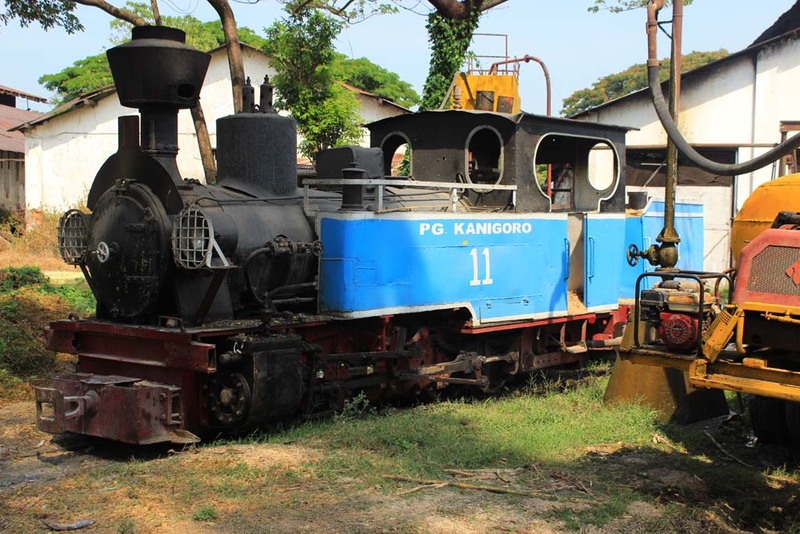 The number 11 is one of only two steam locomotives remain in working condition at Kanigoro. 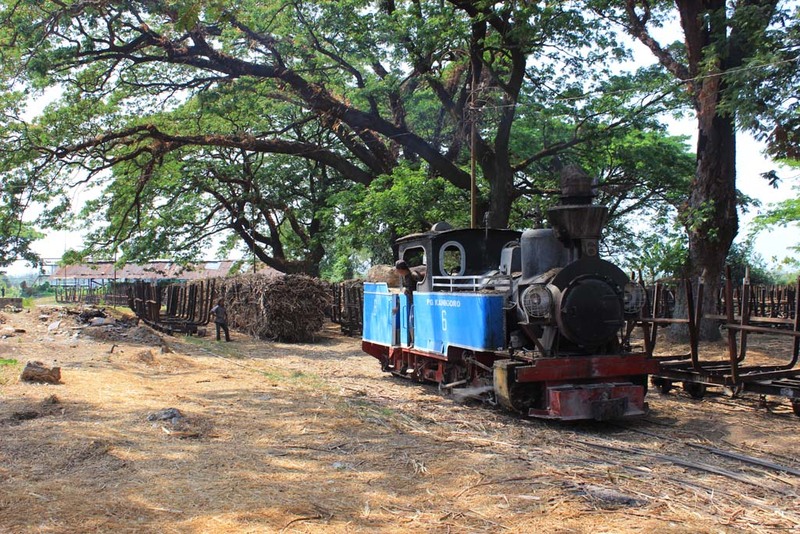 It is amongst three locomotives employed for shunting today. 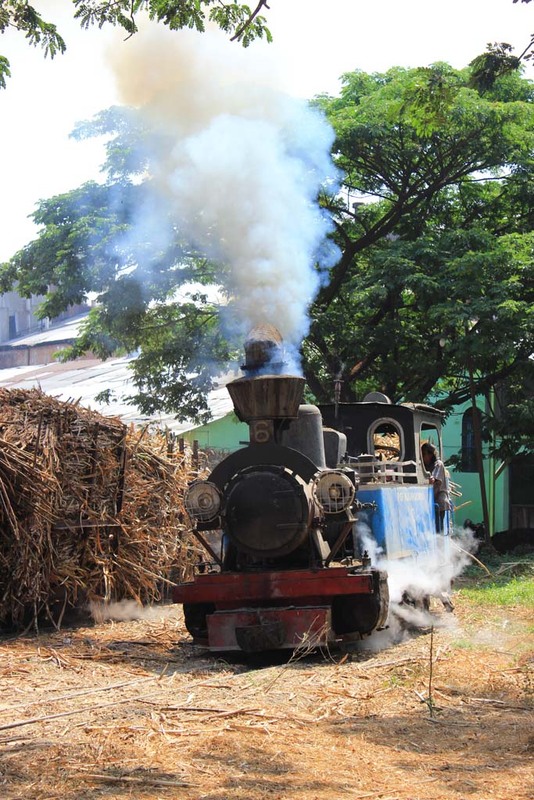 The other steam locomotive worked today is the number 6, which steamed furiously in the yard. 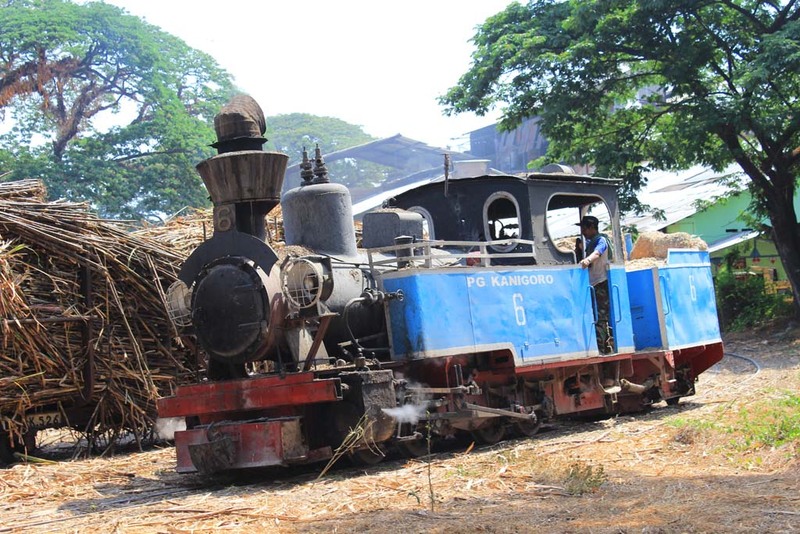 It is also assisted by diesel no.3. 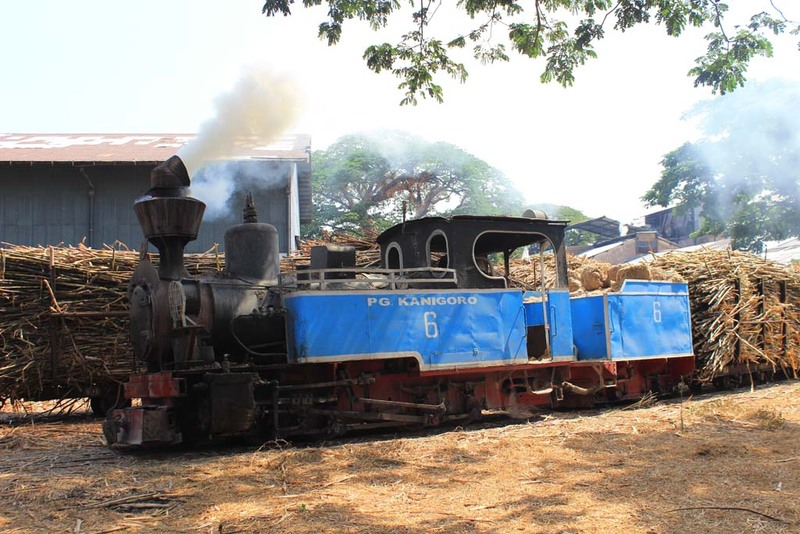 Not long afterward, the number 6 started pushing loaded wagons into the mill. It is also shrilling the loudest whistle that we’ve ever heard throughout the journey. Even exceeding that of Tasikmadu’s Luttermoller. 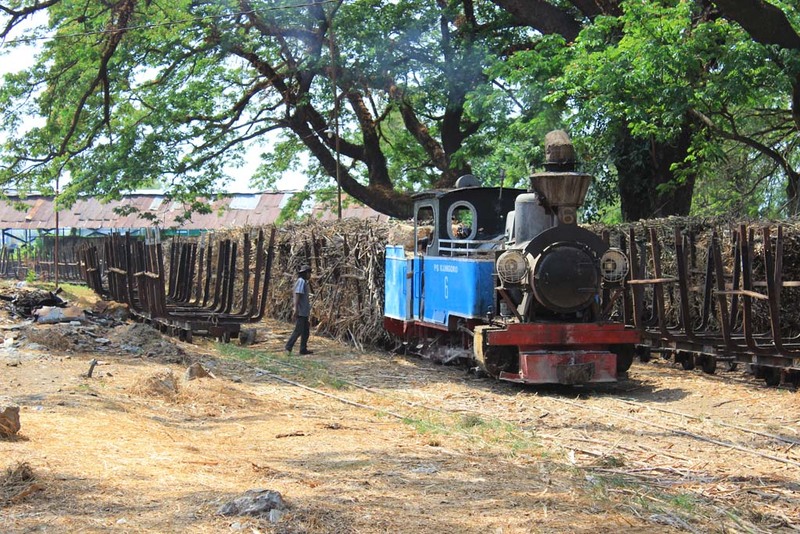 After it delivered a train of loaded wagons into the mill, it went to the receiving yard to pick another train of loaded wagons. We went to the locomotive shed to see what’s inside there. 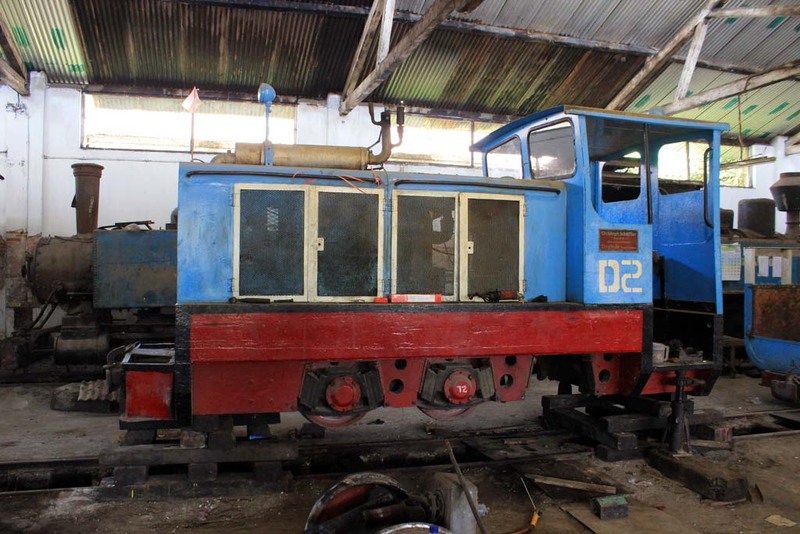 We were greeted by the sight of this German-built diesel locomotive which is mounted for maintenance. 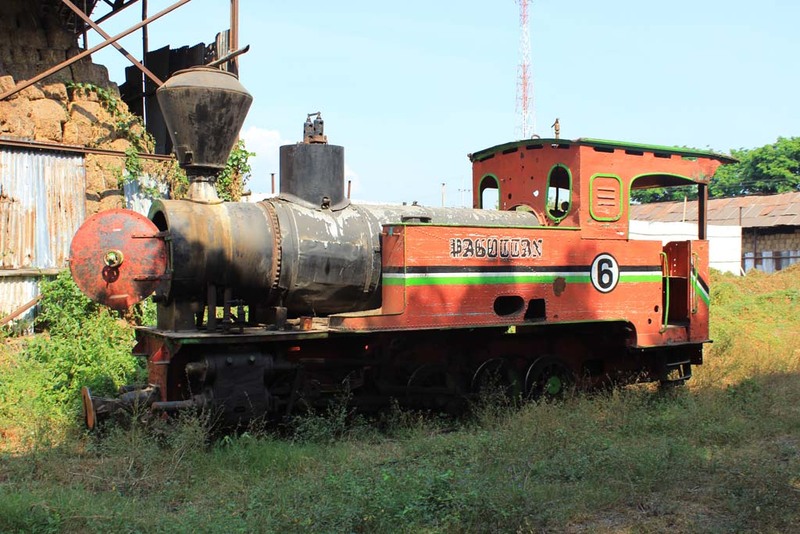 But for me the highlight of my visit to Kanigoro got to be seeing the last surviving Vulcan steam locomotive in Indonesia, still in its original configuration. 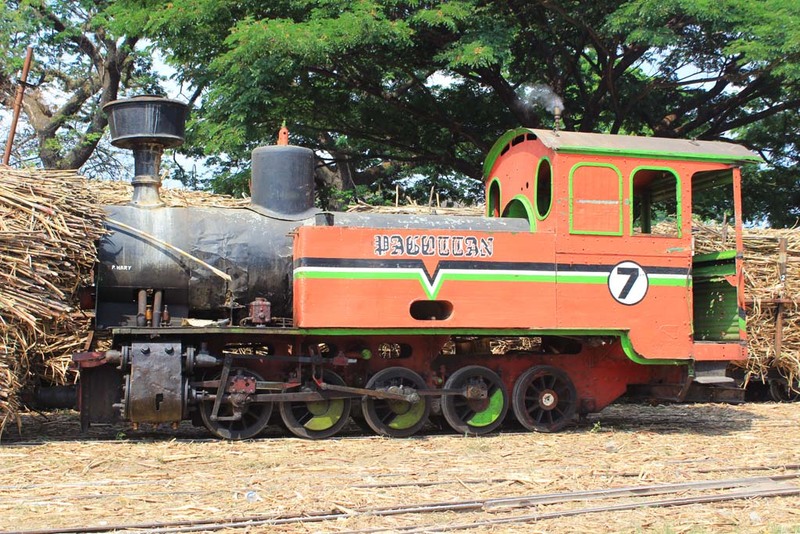 Vulcan is one of three American marquee who supplied narrow gauge steam locomotives in Java, other than Baldwin and Alco. 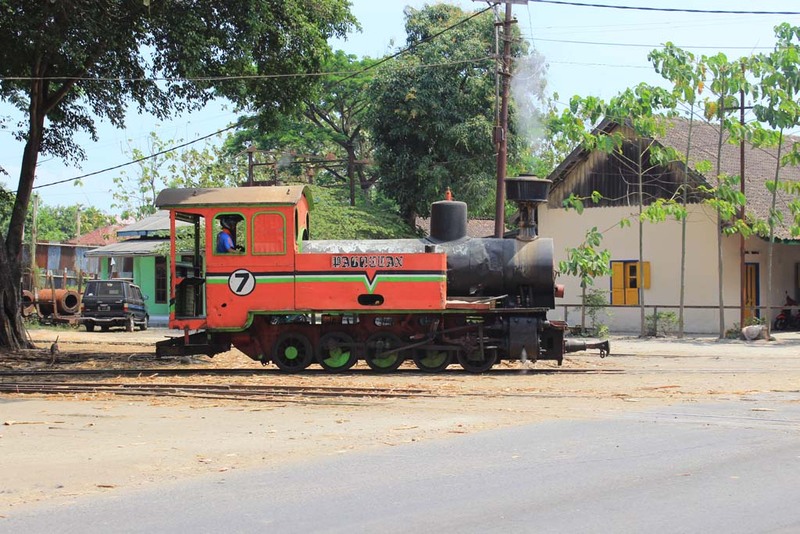 In fact Vulcan locomotives were the most numerous American built narrow gauge steam locomotives in Java. 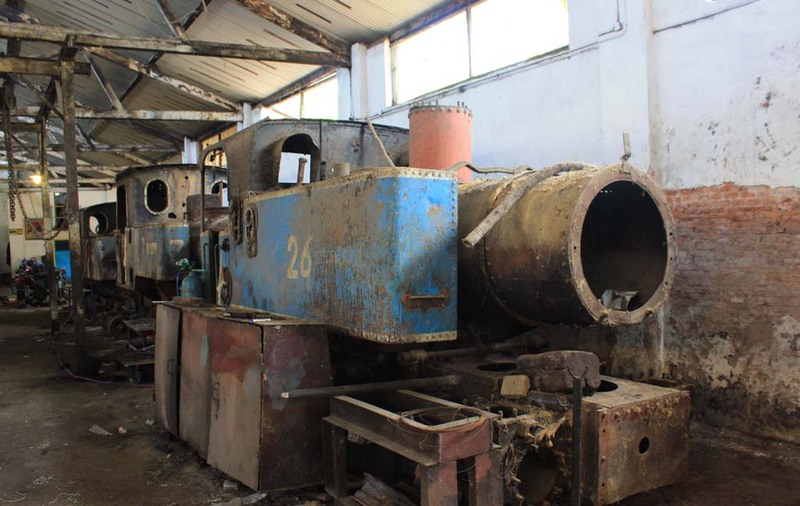 Up until 1970s, you could see many Vulcan locomotives. 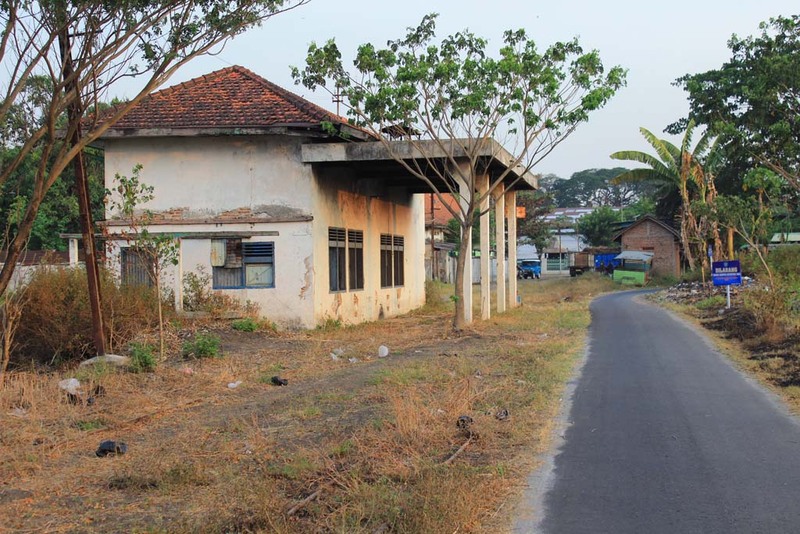 But their number were dwindled in 1980s and 1990s when they were withdrawn, either because of technical reason or because the mill that operated them closed down and demolished (such as Jatiwangi mill in West Java). 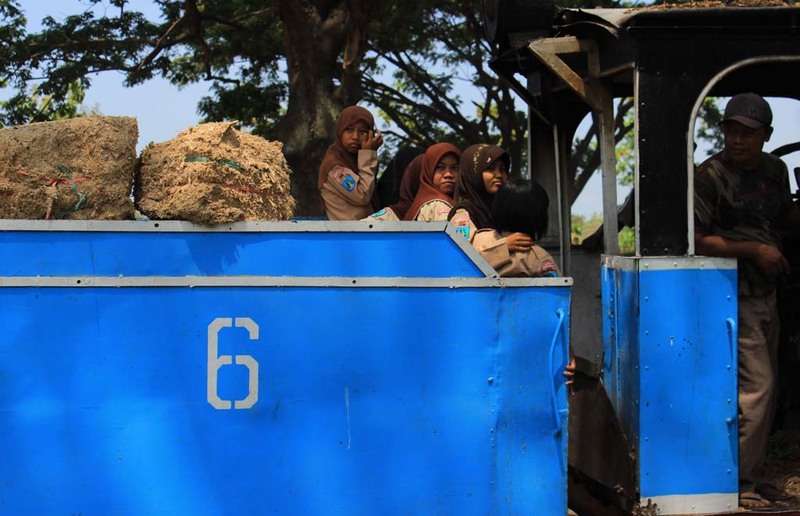 This number 5 is one of only two Vulcan locmotives remain in existence in Indonesia today. 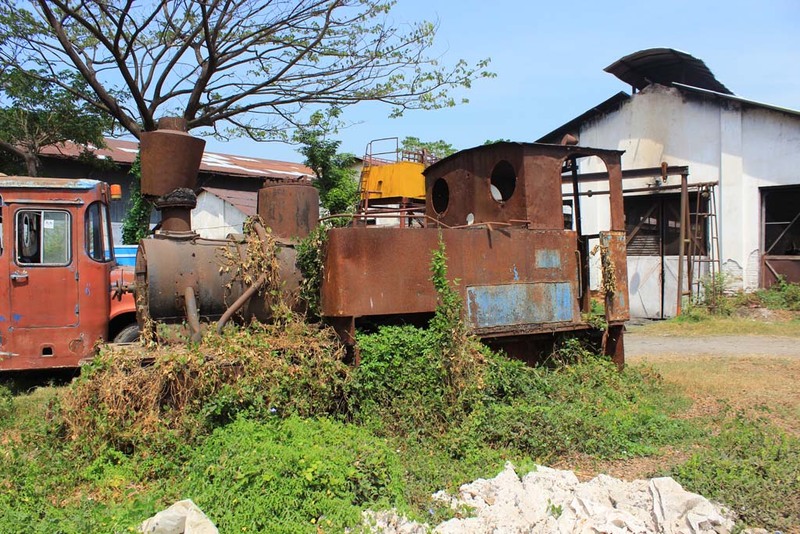 There is another one in Gempolkrep mill, which used to be owned by Lestari sugar mill in Kertosono, before being relocated after Lestari shut down its railway system in 1986. 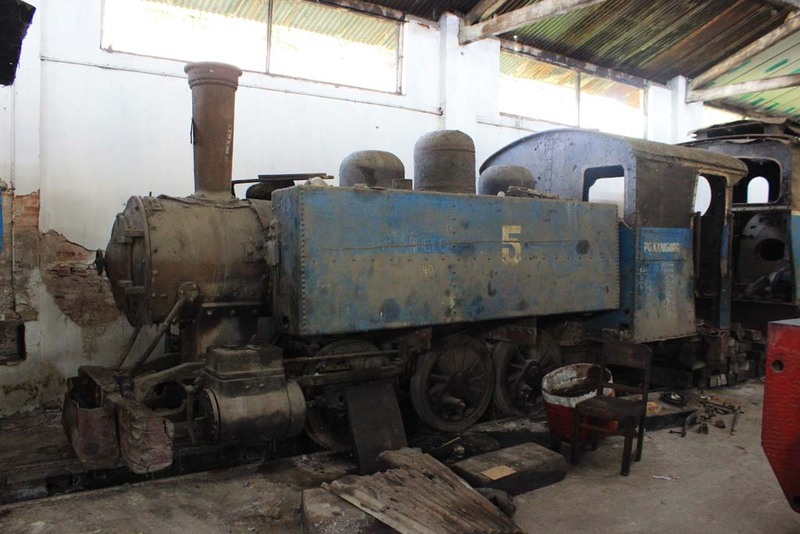 But that loco have been heavily modified and totally unrecognizable, leaving Kanigoro number 5 as the only Vulcan loco still in original condition. 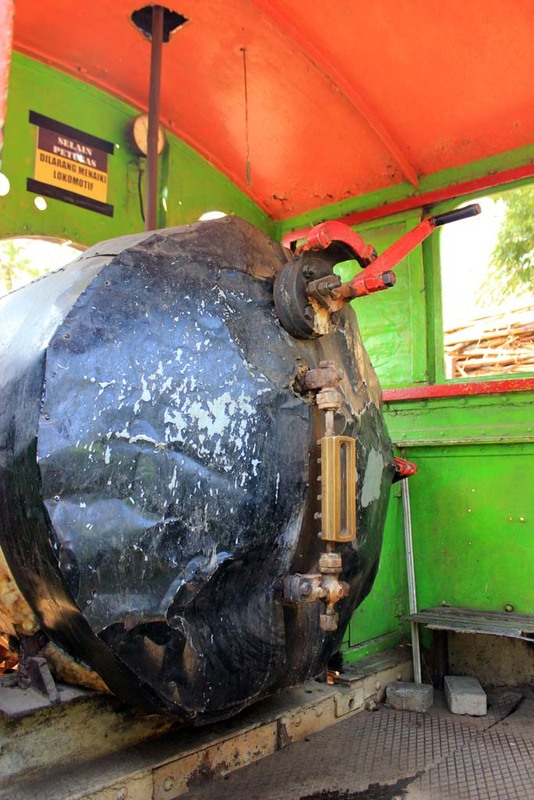 One unique feature of the Vulcan loco is the fact that the wheels of middle axle is not flanged, allowing the loco to negotiate extremely tight conrners. 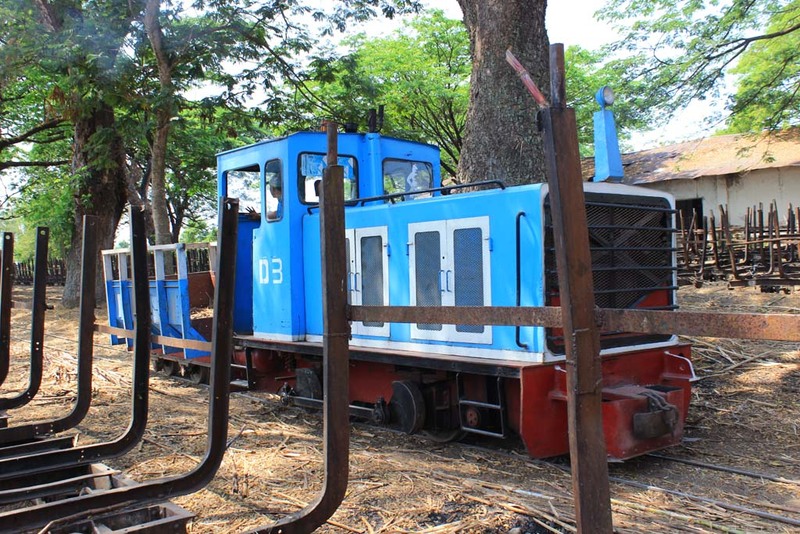 Another unique inhabitants of Kanigoro locomotive shed are a pair of DuCroo & Brauns mallets. 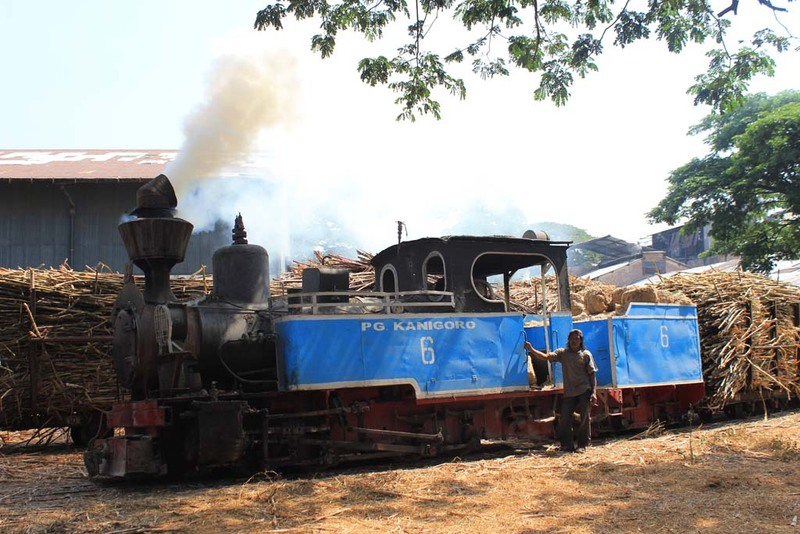 These locos were transported from Semboro to here several years ago. But I was told that they had never been operated in this mill. Instead, they were used for spare parts source. There is a locomotive roster board in the shed master’s office. You can see how small the number of locomotives in this mill. I went out again to see the number 6 hauling loaded train in the yard. Apparently some school kids would prefer to have a joyride before returning back to their home from school. 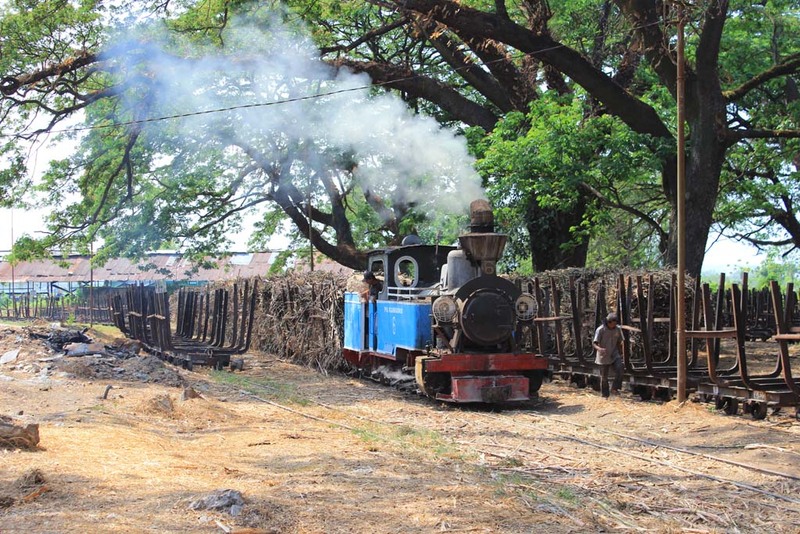 We left the mill soon after, while the number 6 kept busy hauling and pushing wagons. 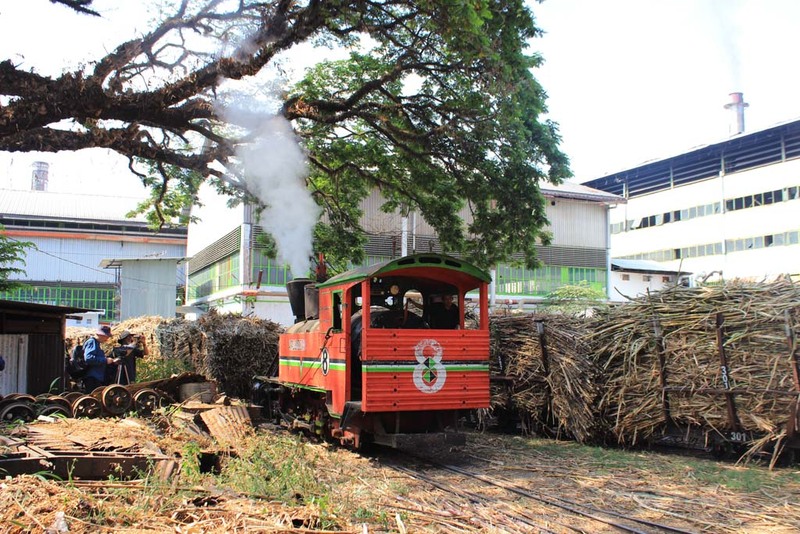 Next stop: Pagottan sugar mill. This mill is not very far from Kanigoro mill. Only a few kilometers to the south of Kanigoro. To save time and money, we decided not to “knock the front door and ask permission”, instead we went straight to the backyard where we parked the car near a level crossing. I have to say that this mill is the worst mill I have ever visited in this journey. 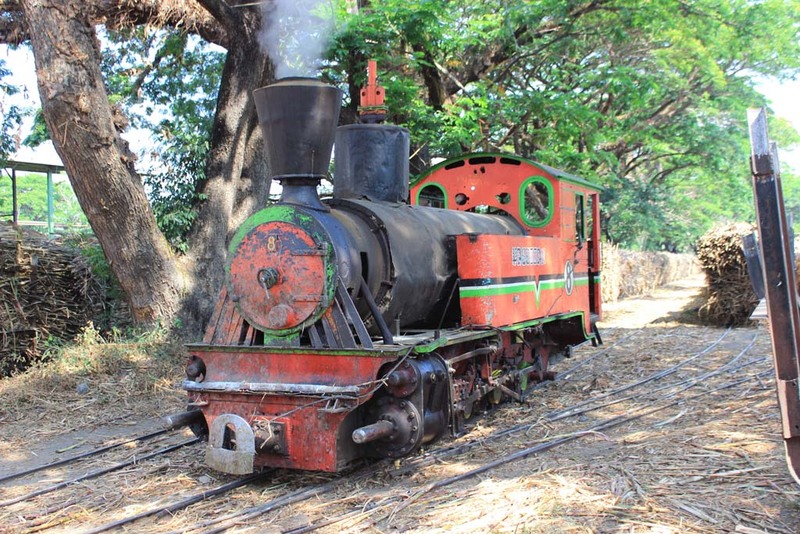 Not just it is lacking its field lines, its fleet of steam locomotives have been converted into dull fireless steam locomotives. To worsen the matter, the area where we took most of the photos (in the level crossing at the back of mill compound) has putrid smell. Apparently there is one large open rubbish bin, where locals dumped their rubbish over there. So the uncontained rubbish bin kept spreading foul smell in the area. While waiting for further action, Geoff and Hayden decided to have a break and some drinks in a foodstall near there, Paul went to have a haircut in a former station master house. 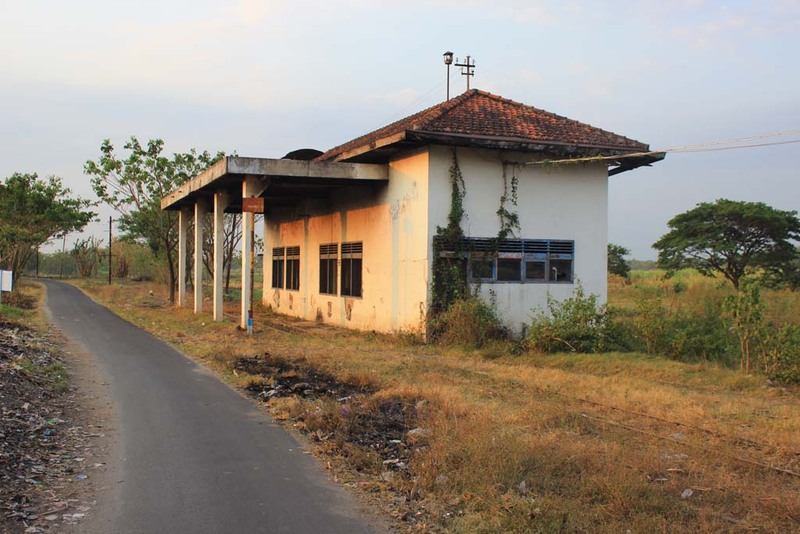 While I decided to explore the remains of Pagottan railway station. 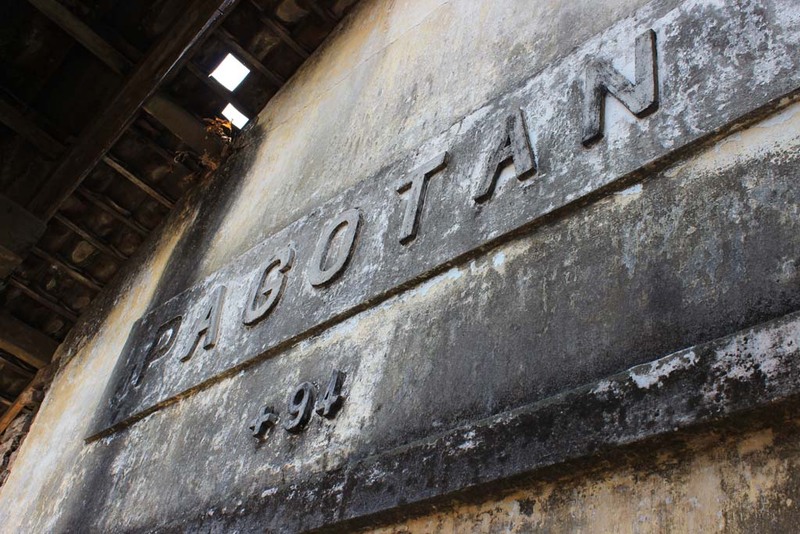 Just behind the mill compound is the remains of Pagottan railway station. 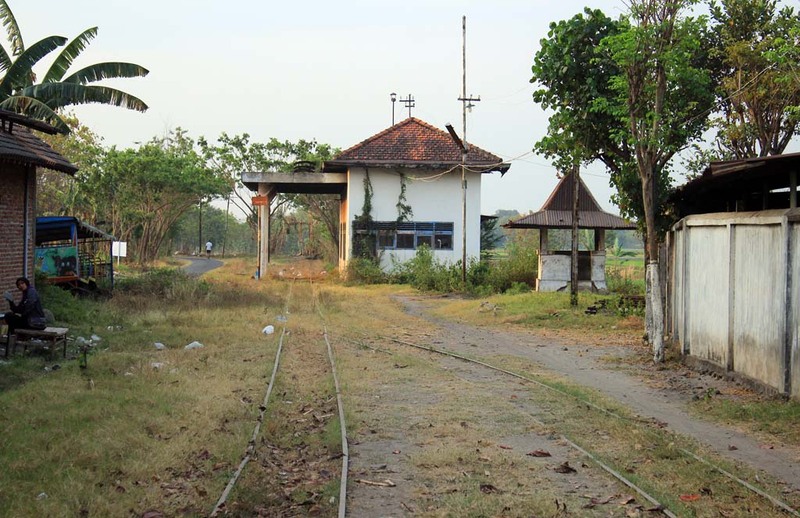 It is part of the now closed Ponorogo branch line, which ended its operational life in 1984. The former railway yard is pretty much intact, although the rails are nowhere to be seen. The station building is also largely intact, although it is now deserted. 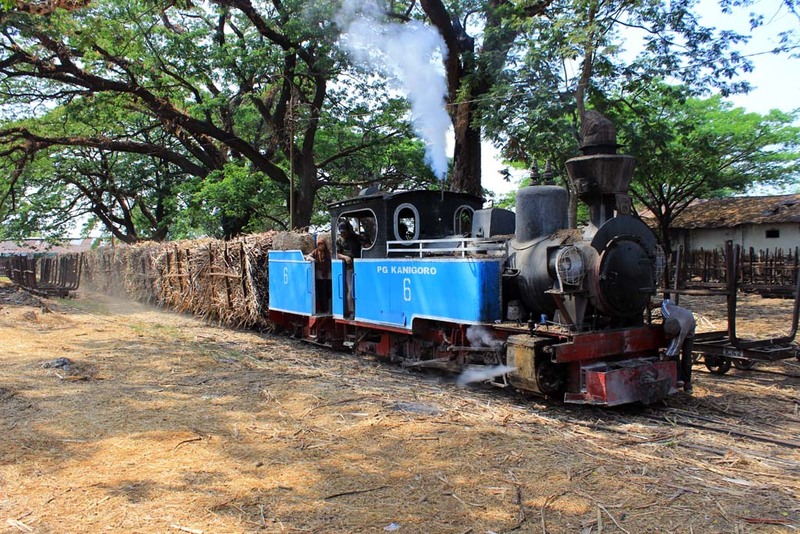 I believe that back then there used to be a branchline that entered the sugar mill compound, where the state railway would utilize that the retrieve the produce from the mill. A visit to the mill will not be complete without a visit into the inside part of the mill. Since we didn’t have official permit to enter, we decided to bribe the security just to have brief visit into the yard inside the compound. 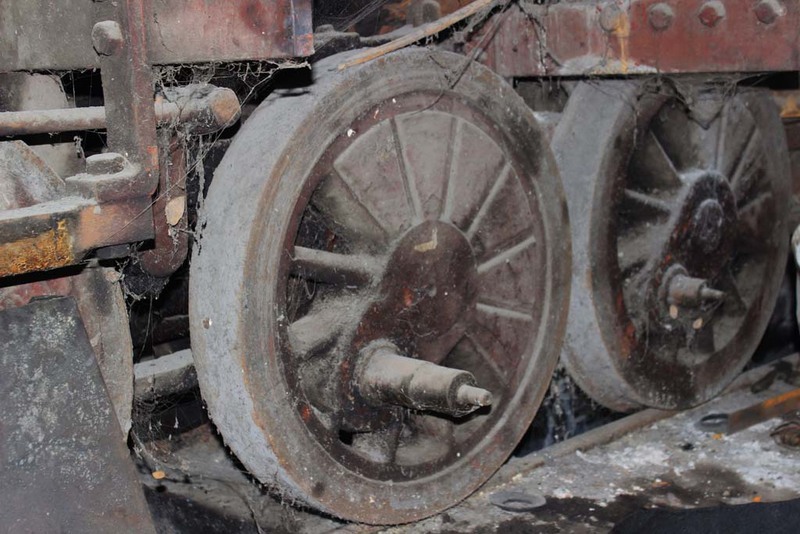 Once inside, we were greeted by the sight of number 7 idle between the duties of pushing loaded wagons into the mill. 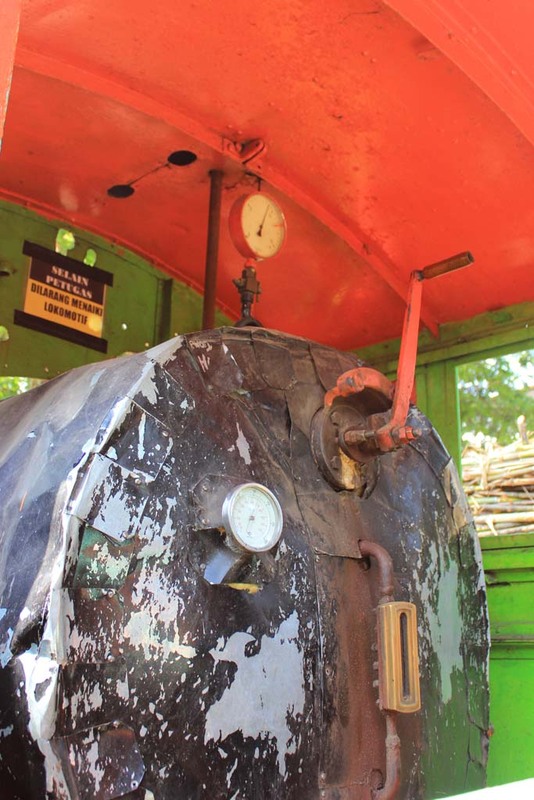 We peek inside its cab, to see that it no longer has firebox. 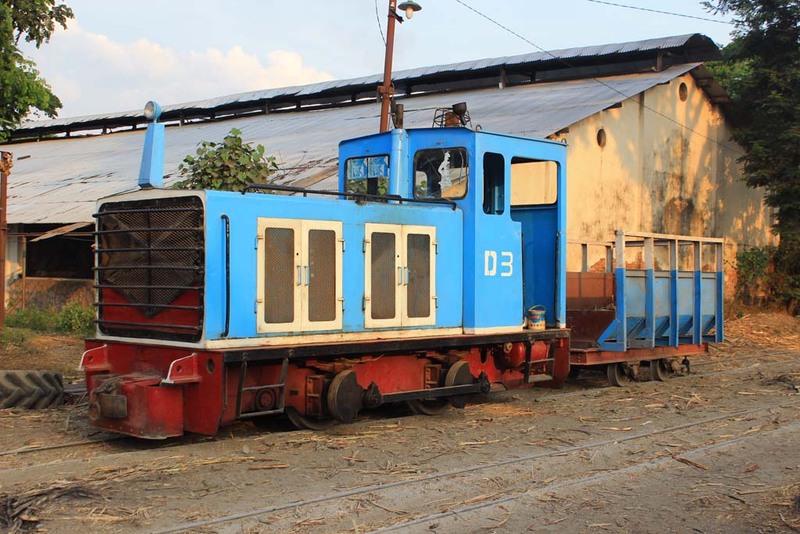 Some diesels are also employed for shunting duties. We went further and found number 8 is also idle. 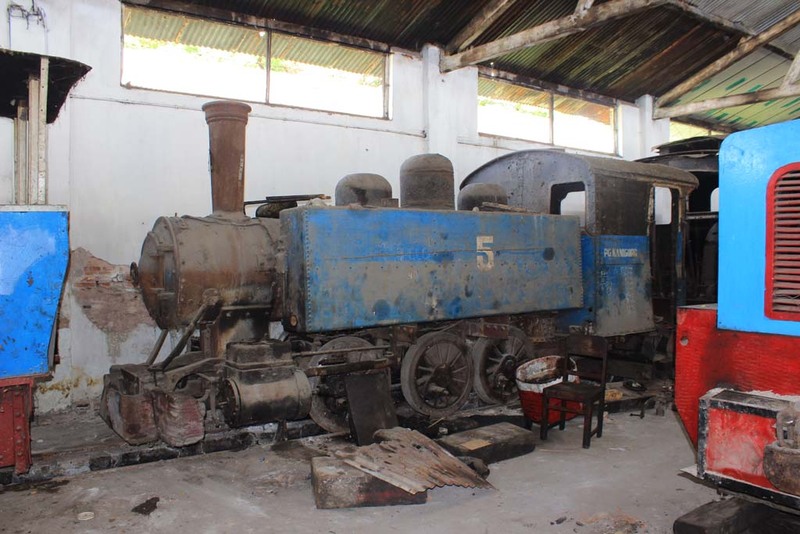 Since it is a fireless loco, it is no longer have firebox in place. The steam pressure gauges are also look newer than the one in number 7. The yard looks very busy today. Not long afterward, the number 8 began to move to the entrance door. It stopped just next the security post. The relaxed mood belies the fact that something went wrong here. Apparently the rear axle derailed. 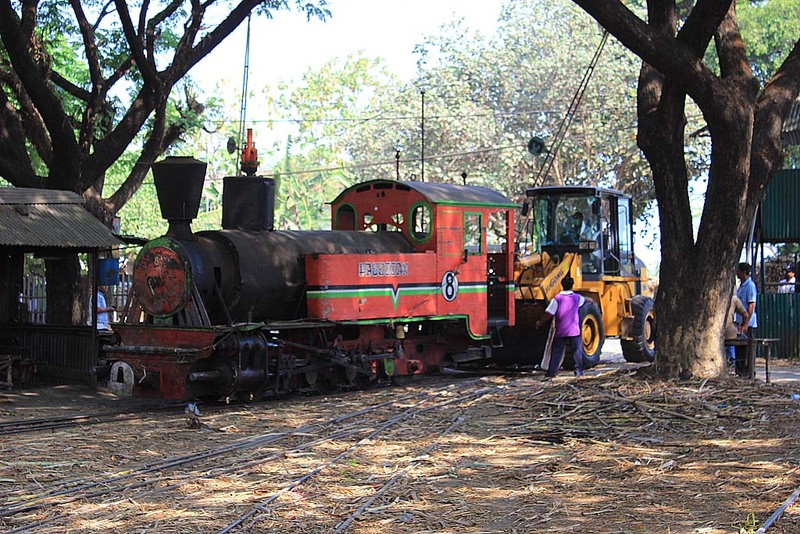 So a tractor is deployed to rerail the locomotive. 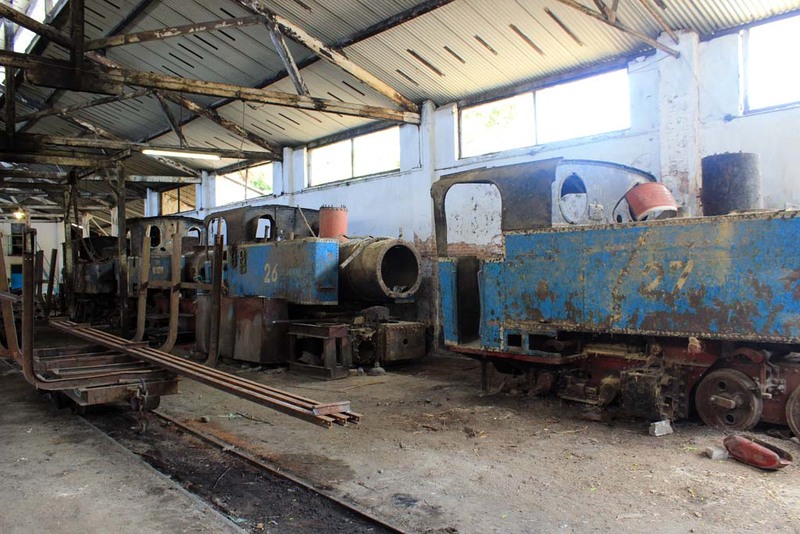 In one corner of the yard, we came across the number 6 parked next to a row of disused tenders. 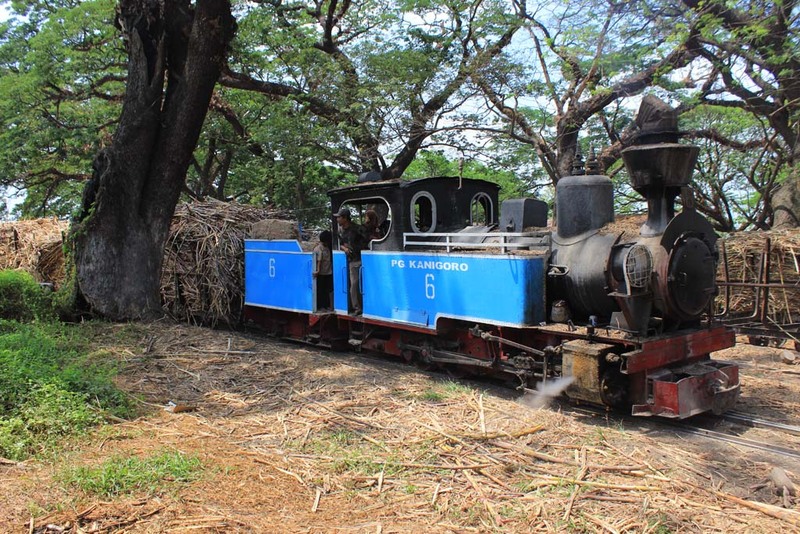 Just like number 7 and 8, it has also been converted into fireless loco. 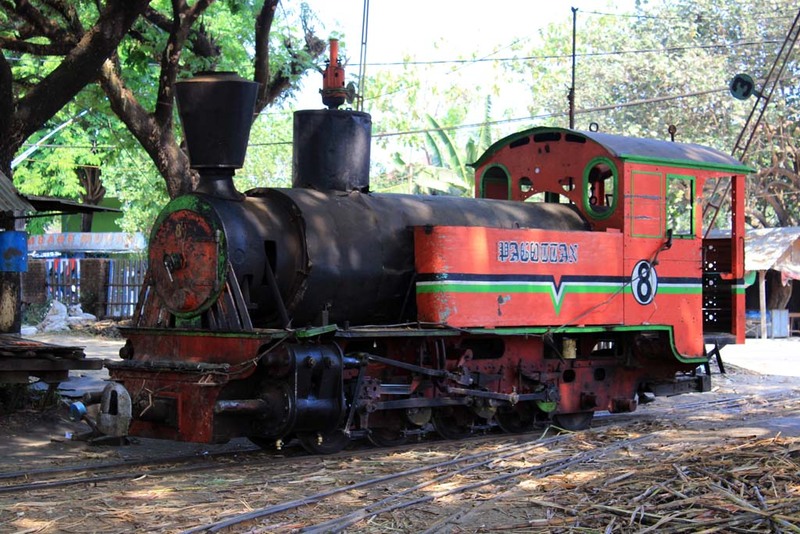 Although the loco doesn’t seem to be in operational condition. As the sun gets lower, the shunting activity increases. 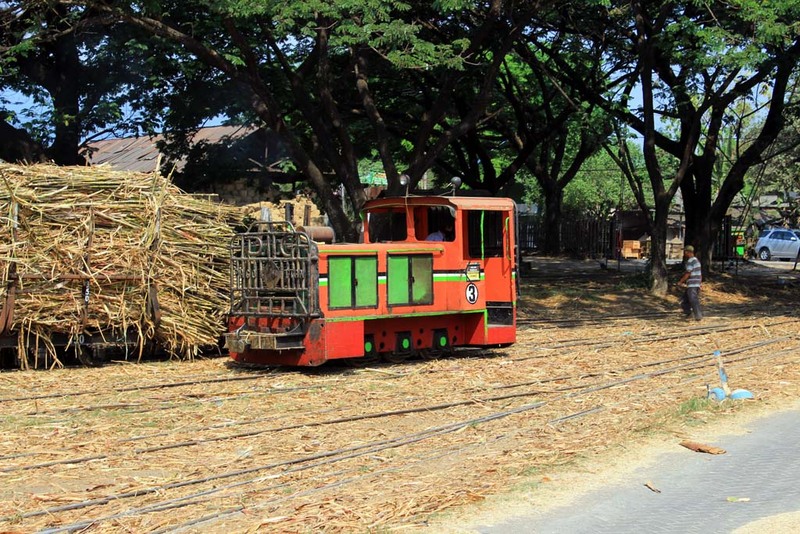 A small diesel in Hot Rod livery is hauling empty wagons into the road yard. 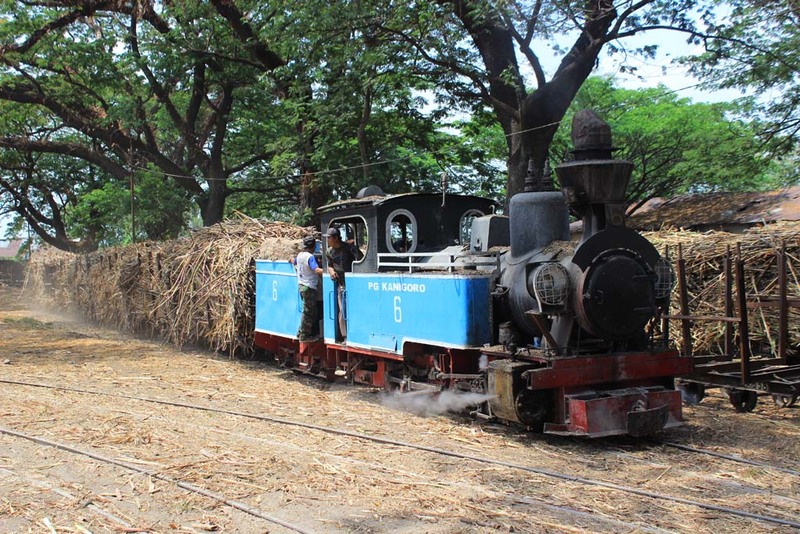 While a pair of diesels are employed to push the loaded wagons into the mill. Well, it’s shift changing time and apparently our “permit” has expired as it is not applicable on the guards on the following shift. So we decided to return back to Kanigoro. Since it is getting late, there are fewer activities to be seen. The diesel is now parked idle. Since I have seen many activities before, I decided to explore the remains of the field line to the north of the compound with Paul. This weighbridge must have long been abandoned, especially since Kanigoro shut down its field lines. It wasn’t just Kanigoro field lines that used to be here. 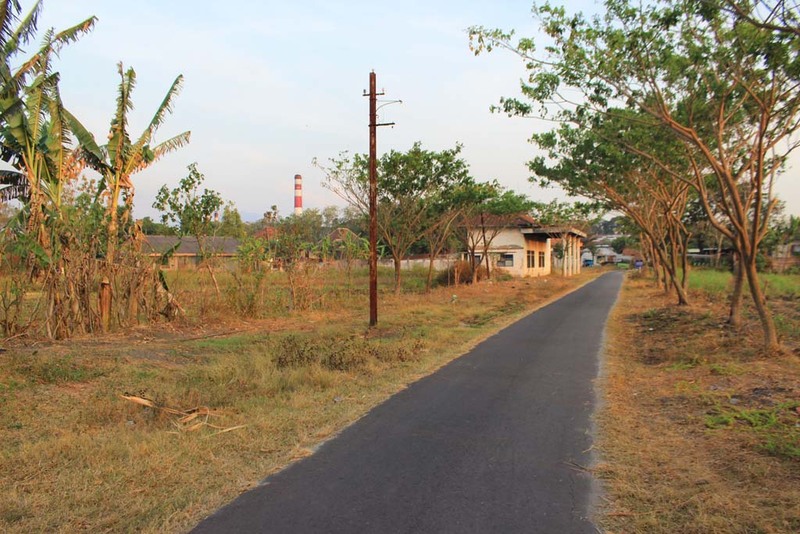 The asphalted road was built on a former roadbed of Madiun-Ponorogo branchline too. 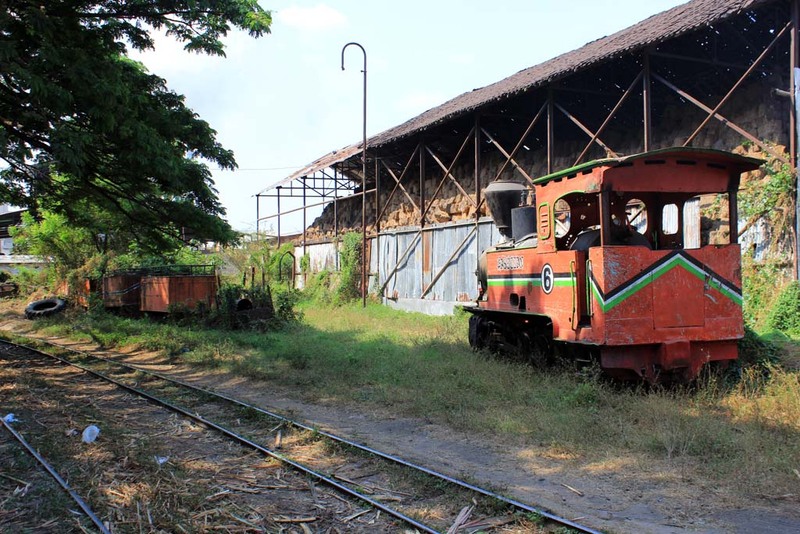 When the Ponorogo branchline closed in 1984, the Kanigoro’s field lines operation soldiered on for several more years, before being closed in the wake of 1997-1998 economic and political crises. As I head back south, I didn’t went straight into mill. 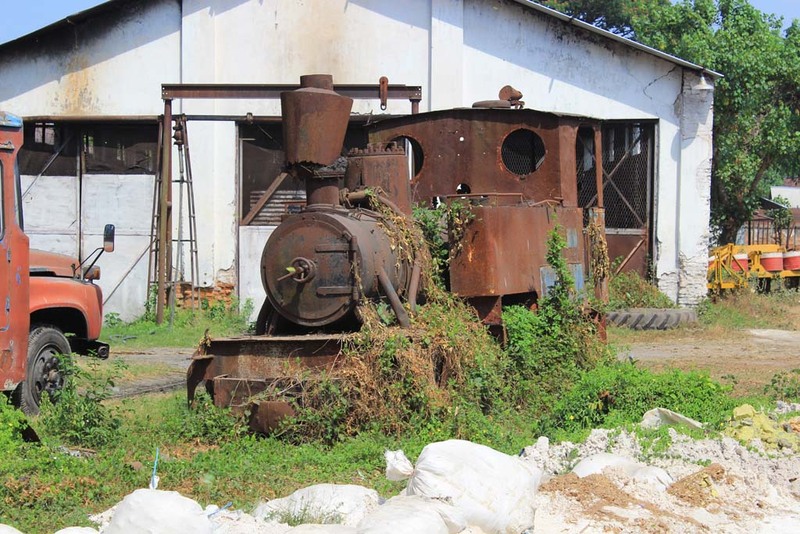 Instead I explored the remains of Kanigoro railway station. 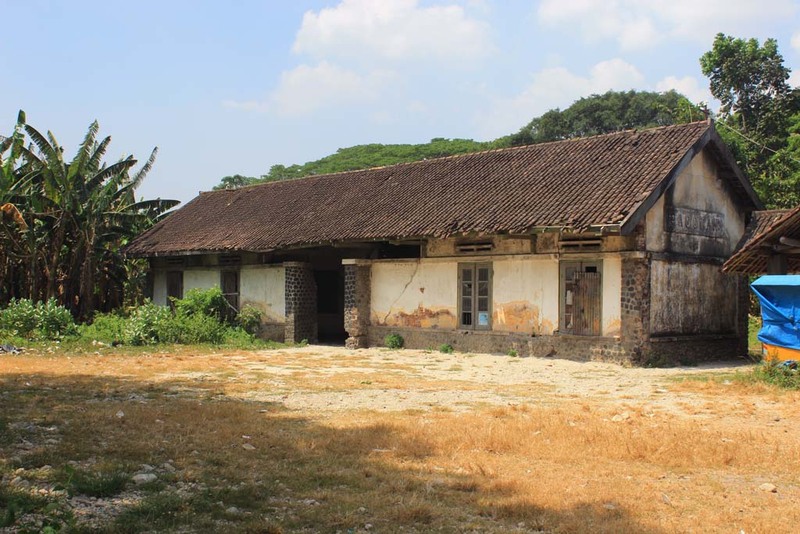 Unlike Pagottan, Kanigoro station has been occupied by squatters that turned it into their house. Even its former railway yard have also been packed with houses. When I went into the area, its occupants looking at me in suspicious manner. Some even asking whether if the line will be reopened (which could lead to their eviction). I simply answered that I have no idea regarding to that matter. I met the rest of the group inside the yard, where they photograph the number 6 still in business. It’s getting late now. We’re all getting tired and decided to return back to hotel for rest and relax. 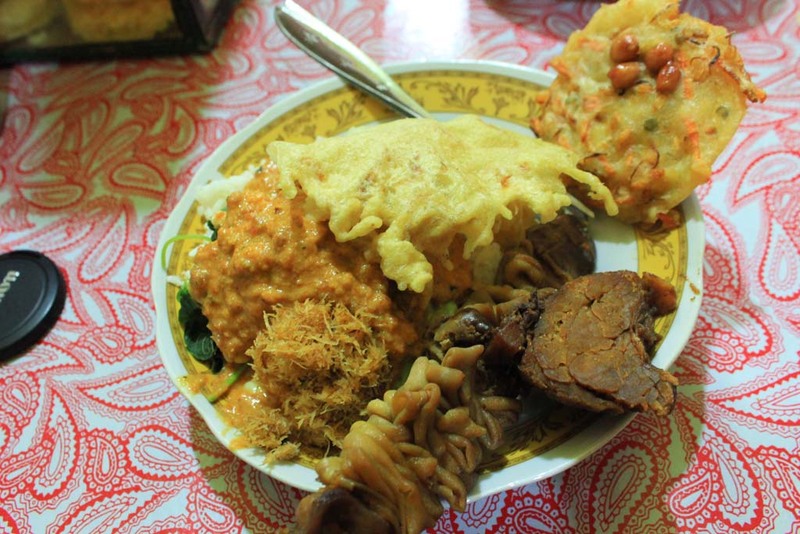 A trip to Madiun will not be complete without sampling its local delicacy named “Nasi Pecel”. 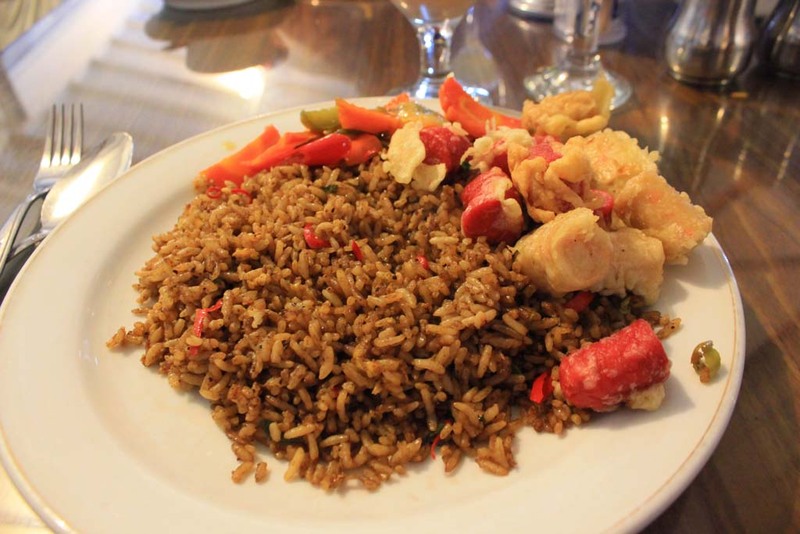 It is essentially a rice served with boiled vegetables, and washed with spicy peanut sauce. We can also order some addition to go with the main meal. I ordered chicken intestines satay and beef shank. 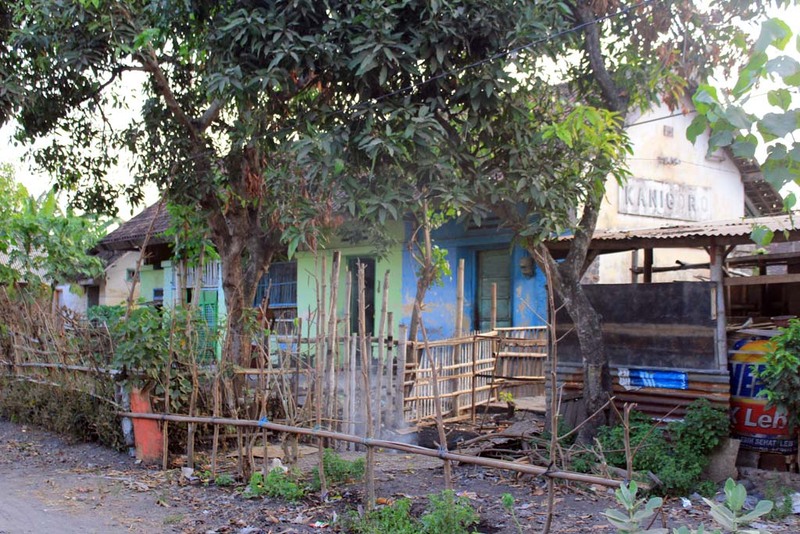 There is one restaurant in one corner of Madiun which is so popular that even the President did actually visited the restaurant when he made official visit to Madiun sometimes ago.